Curriculum Vitae (CV) is your personal brochure. It gives you an opportunity to feature all the aspects that make you the perfect choice for a university. Curriculum Vitae will be listed as an admission requirement for all of the Poland universities. Although its role may not be as significant as when applying for a job (due to a number of other variables), it still is a very important document in your application. In this guide, we will assume that you are going to prepare your Curriculum Vitae from the scratch. 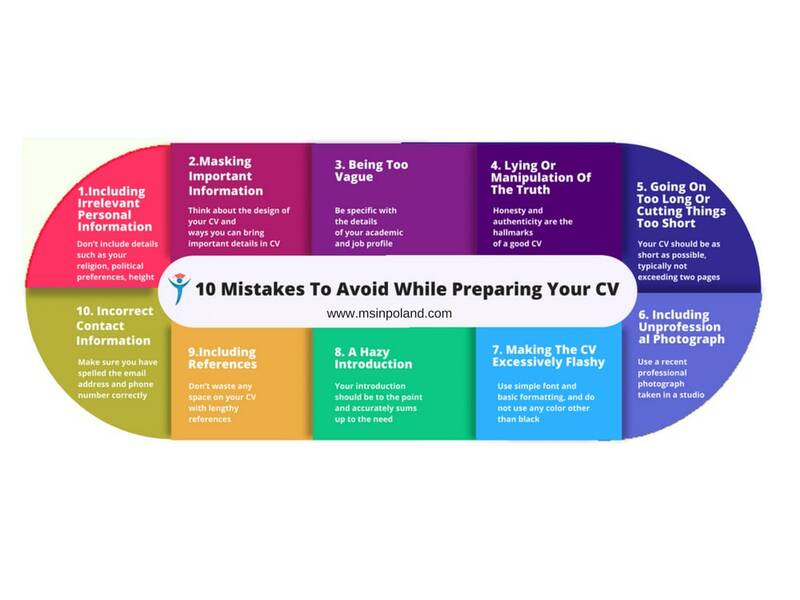 Even if you already have a decent CV, we recommend you to follow this guide and update it and also tailor it to the needs of your target universities. Get your academic certificates, achievements, medals, etc. all in one place so that you won't forget to mention something which is important. Do some homework and determine what kind of candidate that your target university is looking for. You can go look at things like course details, research groups, Professor profiles etc. For example, if you're applying to WUT (focus:Mechanical Engineering), you might want to include that summer internship at Mercedes Benz RD/I in your CV. Read this document to learn about the 'Poland' CV. All the important academic and extra-curricular achievement certificates. Your publications, patents, experience certificates, language certificates, training certificates, if any. There are a number of online tools that you can use to build your Curriculum Vitae. We recommend using Europass template to start off with. This is a pretty simple and nice platform to help you create or update your CV. Also since you are applying to Poland universities, it is better to use European CV format. 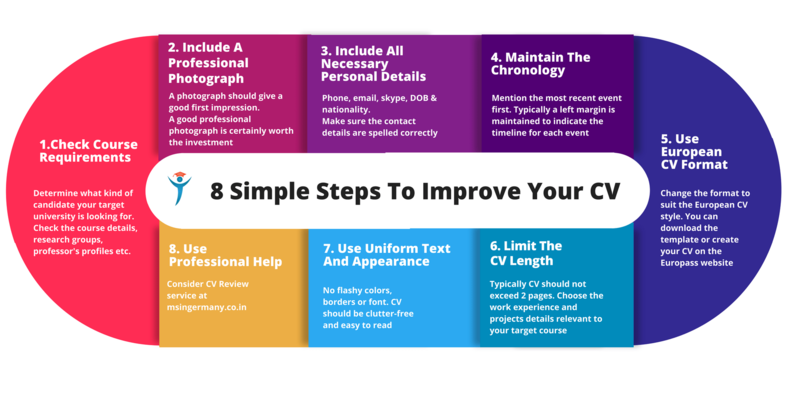 Check whether you want to build a CV from scratch or update your existing CV. Decide if you want to do so online or in your PC. Follow these links to create or update your CV online. If you like to work on a PC instead (recommended), download the template and instructions here. Update your personal details. Include/exclude some sections and sub-sections to suit your academic and job profile. Match details to the target university profile. Do not exceed two pages. Once all the editing is done, cross-verify whether you have entered the correct details. Save the document in its original format and as a PDF file. It is highly recommended not to use the Europass format as it is. Please make necessary modifications to make your CV look unique and not made from the Europass template. In general, your CV should be confined to two (A4) pages. Admission officer probably spends no more than 2 to 3 minutes scanning your Curriculum Vitae, so make sure it is clutter-free and easy to read. Do not forget to mention the timeline for the different events (recent first). Putting your photo in the CV is a quite common practice in Europe and a style that is well accepted. But it is left to your discretion.